The complaint claims the company discharged polluted water into the Kennebec River. 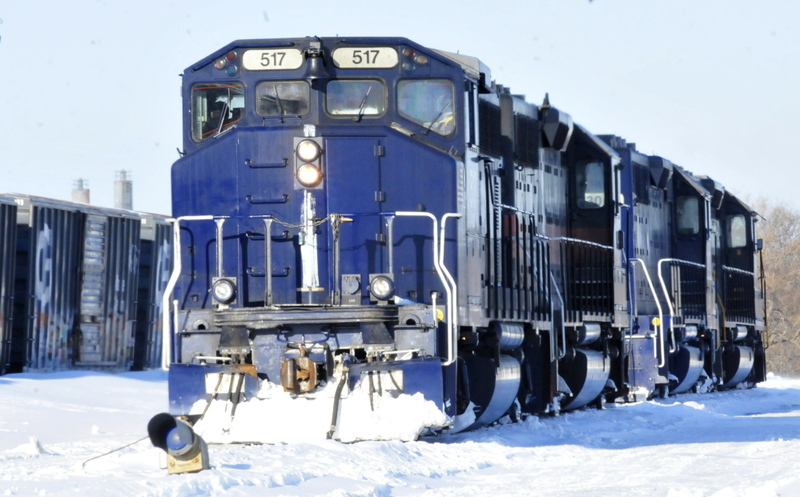 WATERVILLE — Pan Am Railways is facing up to $375,000 in fines from the U.S. Environmental Protection Agency for allegedly violating the federal Clean Water Act at the company’s Waterville railyard. In an administrative complaint filed against the company on Jan. 30, the EPA charged that Pan Am failed to comply with the terms of a state-issued stormwater permit and discharged water containing pollutants into the Kennebec River and failed to maintain and implement a control and prevention plan to mitigate possible oil spills at the facility. Two Pan Am Railways engines idle Monday at the Waterville yard, where the U.S. EPA says the company is facing $375,000 in civil penalties for violating federal and state environmental regulations. The North Billerica, Mass.-based company’s 100-acre rail yard along College Avenue is used to refuel locomotives and repair, maintain and build locomotives and freight cars. According to company officials, it has a 110,000-gallon storage capacity for diesel, heating fuel, oil lubricant and waste oil. Nearly half the storage is in two 25,000-gallon diesel tanks. In its complaint, the EPA contends that Pan Am’s stormwater pollution prevention plan was inadequate, and as a result, water discharged from seven different outfalls into the Kennebec River contained pollutants including chemical waste, biological materials, rock, sand and industrial waste. EPA conducted annual inspections since 2011 with the last inspection on Aug. 22. The company was required to comply with Maine’s “multi-sector general permit for industrial stormwater,” a statewide regulation that provides rules for operating industrial facilities. Even though the permit is administered through the state, the federal EPA has jurisdiction in an enforcement action, said Maine Department of Environmental Protection spokesperson Karl Wilkins. According to EPA, Pan Am failed to describe all its control measures and best management practices to prevent polluted runoff, did not “perform good housekeeping procedures” — such as keeping debris piles outside without structural controls, oil-stained ground throughout the site, and oil sheens in catch-basins — failed to maintain and repair industrial equipment and systems and did not include a map with the sites of its structural control measures and stormwater conveyance system on its pollution prevention plan. The complaint names Pan Am and two of its subsidiary railroads, the Maine Central and Springfield Terminal Railways. “EPA is alleging that the storm water discharges were unauthorized because they were not in compliance with the terms of the permit,” said Jeff Kopf, the senior environmental counsel for EPA’s Boston office. The spill prevention control plan that Pan Am had for the site, intended to mitigate the risk and effect of an oil spill, was also deficient, EPA alleges. Pan Am “failed to adequately provide for measures which would prevent the discharge of oil from reaching the waters of the United States,” EPA states in its complaint. Specifically, the company did not include a diagram with the specific location of each oil storage container or a description of the type of oil it contained in its plan, failed to maintain appropriate secondary containment for multiple oil containers, did not conduct appropriate inspections and failed to maintain inspection records among other violations. The failure to “maintain and fully implement an adequate SPCC plan leaves a facility unprepared to deal with an oil spill and to prevent a spill from having potentially serious consequences,” EPA states in the complaint. The EPA can assess a maximum fine of $187,500 for each count in the two-count complaint, but Pan Am may not end up paying that much to the agency, Kopf explained. “They are put on notice about what the potential maximum liability might be” through the complaint, but a resolution to the case might include reduced fees, depending on informal settlement talks between EPA and the company, Kopf said. Settlement amounts are usually less than the maximum fine, he noted. Pan Am has 30 days to respond to the complaint, but may be given a 30-day extension, Kopf said. It is unusual for settlement talks to go further than three months before the agency brings it to a formal hearing with an administrative judge, he added. EPA officials have been working with Pan Am to resolve the issues since the initial inspection in 2011, and the company is nearer to compliance with environmental regulations, Kopf said. “I wouldn’t say we’re the whole way there,” he noted. The Waterville yard is one of the company’s major rail facilities. A similarly-sized yard in East Deering, Mass., is also facing enforcement for similar violations, Kopf said. Cynthia Scarano, a Pan Am executive vice president, said the company expects to hold informal settlement talks with the EPA within the next week. “We have requested an informal conference, and on completing the administrative hearing we will have further comment,” Scarano said. “At this point, I’m not denying or admitting” violations alleged by the EPA, Scarano added.